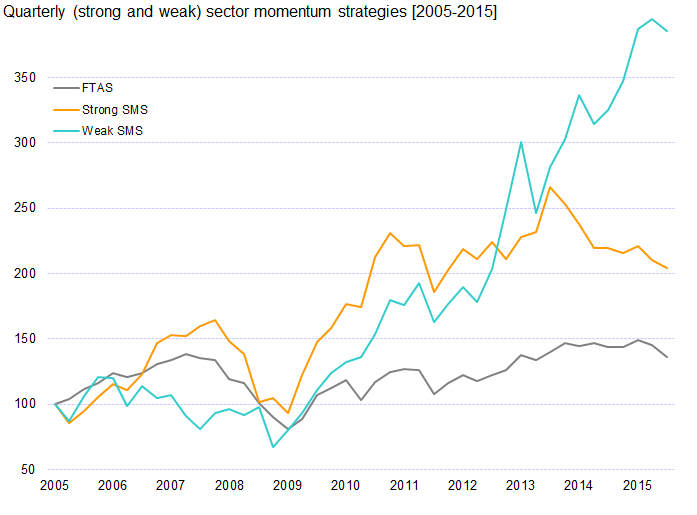 Do FTSE 350 sectors display a quarterly momentum behaviour that can be exploited? The portfolio comprises just one FTSE 350 sector, that being the sector with the strongest performance in the previous quarter. So at the end of each quarter, the portfolio is liquidated and a 100% holding established in the strongest sector of the quarter just finished. This is held for three months, when the portfolio is liquidated and re-invested in the new sector. Therefore the strategy will trade four times a year. Only FTSE 350 sectors with at least three component companies are considered. The period studied was from 2005 to the third quarter 2015. 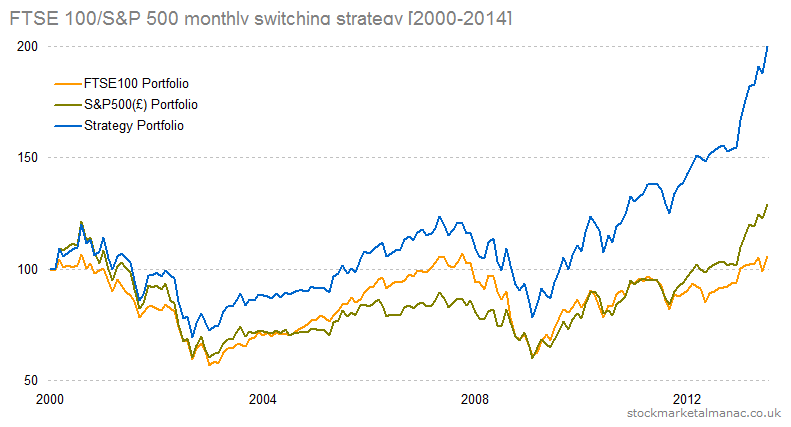 The accompanying chart compares the performance of the two strategies, and adds the FTSE All Share Index as a benchmark. All series are re-based to start at 100. As can be seen, both the SMS strategies out-performed the index over the period of the study. However, they did so with greater volatility (the standard deviation of the Strong SMS quarterly returns was 0.11, against comparable figures of 0.13 for the Weak SMS and 0.07 for the FTSE All Share Index). From 2012 the reversal portfolio (Weak SMS) started strongly out-performing the Strong SMS. A refinement of the strategy would be to hold the two or three best/worst performing sectors from the previous quarter instead of just the one (which would likely have the effect of reducing volatility). Costs were not taken into account in the study. 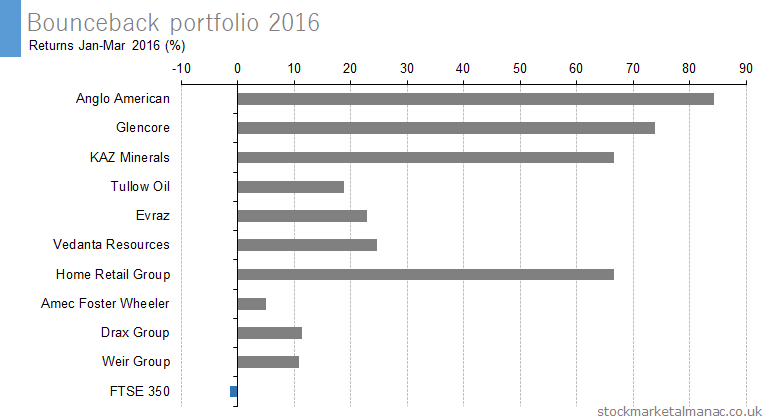 But given that the portfolio was only traded four times a year costs would not have had a significant impact on the overall performance. Extract taken from the newly published The UK Stock Market Almanac 2016. The following table lists the five FTSE 350 shares that have the best returns in July over the last ten years. For example, Elementis has an average return of 7.6% for the month of July. All stocks have risen in July for at least nine of the past ten years. The following table lists the two FTSE 350 shares that have the worst returns in July over the last ten years. For example, IP Group has an average return of -4.1% for the month of July. Both stocks have fallen in at least seven of the past ten years in July. An equally-weighted portfolio of the above strong July stocks would have out-performed every year an equally-weighted portfolio of the above weak July stocks by an average of 9.3 percentage points in July for the past ten years. The following table lists the five FTSE 350 shares that have the best returns in April over the last ten years. For example, Fenner has an average return of 9.11% for the month of April. All stocks have risen in April for at least eight of the past ten years. The following table lists the four FTSE 350 shares that have the worst returns in April over the last ten years. For example, Balfour Beatty has an average return of -4.4% for the month of April. All four stocks have fallen in at least eight of the past ten years in April. An equally-weighted portfolio of the above strong April stocks would have out-performed every year an equally-weighted portfolio of the above weak April stocks by an average of 7.3 percentage points in April for the past ten years. The following table lists the five FTSE 350 shares that have the best returns in March over the last ten years. For example, The Restaurant Group has an average return of 12.4% for the month of March. All stocks have risen in March for at least nine of the past ten years. The following table lists the five FTSE 350 shares that have the worst returns in March over the last ten years. For example, Renishaw has an average return of -4.4% for the month of March. All five stocks have fallen in at least eight of the past ten years in March. An equally-weighted portfolio of the above strong March stocks would have out-performed every year an equally-weighted portfolio of the above weak March stocks by an average of 10.1 percentage points in March for the past ten years. The following table lists the five FTSE 350 shares that have the best returns in January over the last ten years. For example, Computacenter has an average return of 9.3% for the month of January. All stocks have risen in January for nine of the past ten years. The following table lists the five FTSE 350 shares that have the worst returns in January over the last ten years. For example, Unilever has an average return of -3.2% for the month of January. All five stocks have fallen in eight of the past ten years in January. An equally-weighted portfolio of the above strong January stocks would have out-performed every year an equally-weighted portfolio of the above weak January stocks by an average of 10.5 percentage points in January for the past ten years. Although since 1984 the S&P 500 has overall greatly out-performed the FTSE 100 (+1021% against +575%), there are months in the year when the FTSE 100 fairly consistently out-performs the S&P 500. The following chart shows the monthly out-performance of the FTSE 100 Index over the S&P 500 Index since 1984. 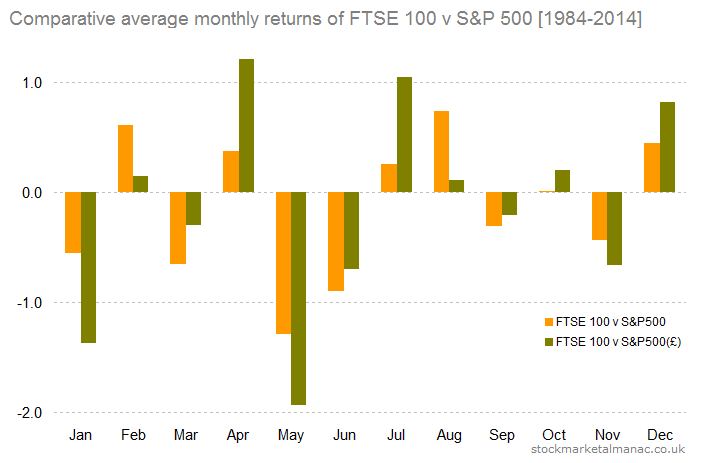 Looking first at the orange grey bars in the chart, this shows, for example, that on average in January the FTSE 100 has out-performed the S&P 500 by -0.6 percentage points (i.e. the UK index has under-performed the US index in that month). From the chart we can see that the five months that are relatively strong for the FTSE 100 are: February, April, July, August and December. 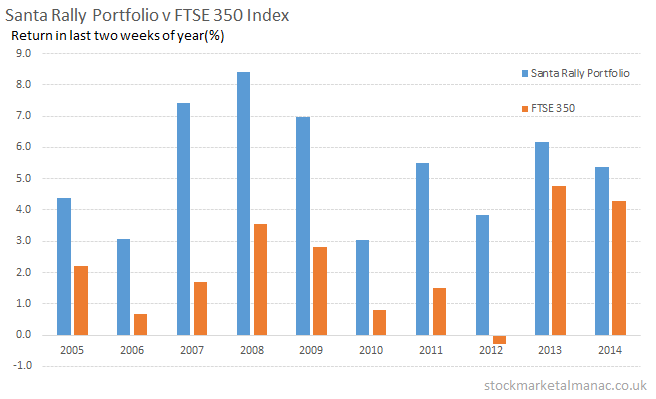 For example, the FTSE 100 has out-performed the S&P 500 in February in 13 of the past 15 years. Now, turning to the bown bars, these display the same average monthly out-performance of the FTSE 100 over the S&P 500, except this time the S&P 500 Index has been sterling-adjusted. One effect of adjusting for currency moves is to amplify the out-performance of the FTSE 100 index in certain months (April, July, and December). Conversely, the FTSE 100 under-performance is amplified in January, May and November. Whereas, before, the relatively strong FTSE 100 months were February, April, July, August and December, we can see that the currency-adjusted strong months are just April, July, and December. The above results suggest a strategy of investing in the U.K. market (i.e. the FTSE 100 Index) in the months April, July and December and in the U.S. market (i.e. the S&P 500 Index) for the rest of the year. 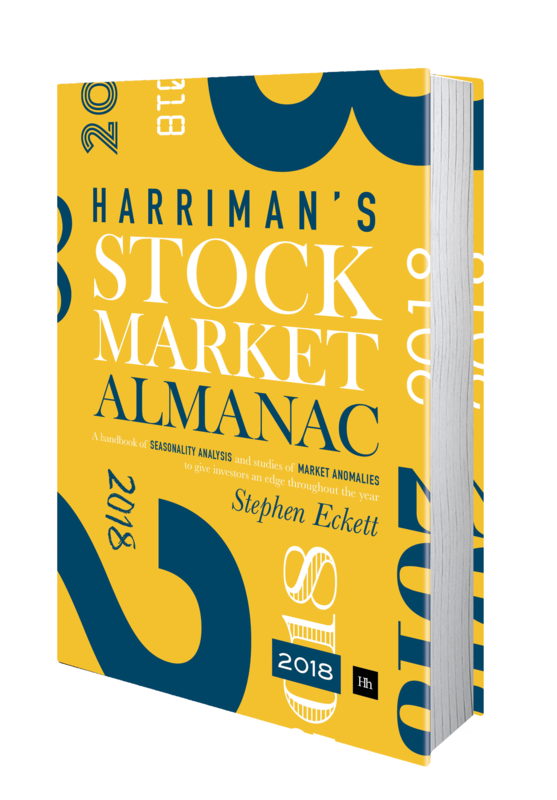 In other words, the portfolio would be invested in the S&P 500 from January to March, at the end of March it switches out of the S&P500 into the FTSE 100 for one month, then back into the S&P 500 for two months, into the FTSE 100 for July, back into the S&P 500 for four months, then back into the FTSE 100 for December, and finally back into the S&P 500 to start the next year. The following chart shows the result of operating such a strategy from 2000. 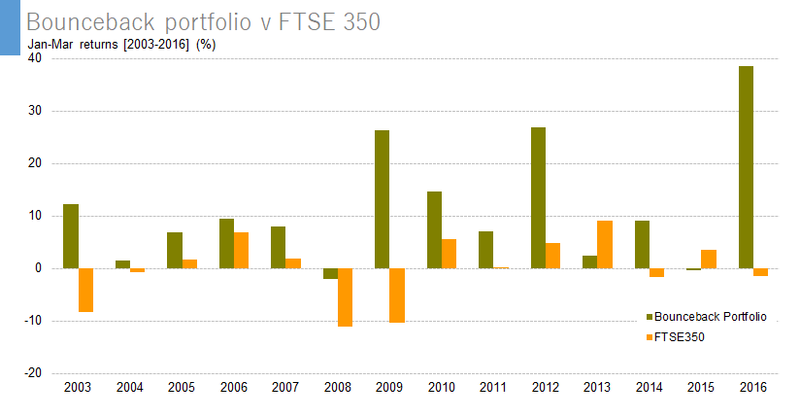 For comparison, the chart also includes the portfolio returns from continuous investments in the FTSE 100 and S&P 500. 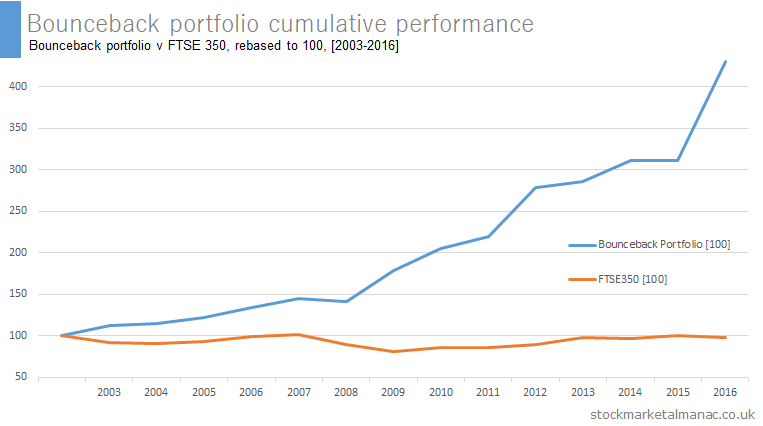 The final result: the FTSE 100 portfolio would have grown 7%, the S&P 500(£) risen 32%, but the FTSE 100/S&P 500 monthly switching portfolio (FSMSP) would have increased 114%. Switching six times a year would have incurred some commission costs, but these would not have dented performance significantly. 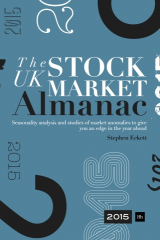 The above is an extract from the newly published UK Stock Market Almanac 2015. The following table lists the five FTSE 350 shares that have the best returns in December over the last ten years. For example, G4S has an average return of 6.3% for the month of December. All stocks, except Ashtead, have risen in every December for the past ten years. The following table lists the two FTSE 350 shares that have the worst returns in December over the last ten years. For example, Rank Group has an average return of -4.2% for the month of December. Both stocks have fallen in seven of the past ten years in December. An equally-weighted portfolio of the above strong December stocks would have out-performed every year, except 2008, an equally-weighted portfolio of the above weak December stocks by an average of 10.1 percentage points in December for the past ten years.